NC60’s Leadership project refurbished and added new playground equipment, and landscaped the playground in the environment. September 2003. Camp New Hope’s playground equipment and landscaping will be updated this weekend with safety in mind. Camp New Hope, off N.C. 86 between Chapel Hill and Hillsborough, caters to youths and families, offering services ranging from grief counseling to traditional summer camp activities. The project is directed by leaders of The WorldLegacy, which offers training for adults and a teen leadership program.The group is seeking volunteers and materials for the 48-hour playground face-lift. NC32’s Leadership project designed and built a walkway and sensory garden for the children. 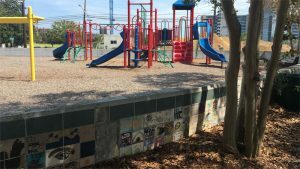 An outdoor space called Bunny’s Garden was transformed into a multi-sensory environment complete with fountains, benches, wheelchair-friendly surfaces and decorative statues. August 2000. A 200-foot wall of unity, love, and peace was created by children and adults by painting and glazing their visions on the tiles. January 2003. NC52. Over 1000 six by six individually painted and glazed tiles depicting a person’s vision for the world completed a section of the peace wall in Myrtle Beach. Children and adults from around the United States contributed to NC21’s Leadership project in January of 1999.